The top of my crochet wish-list . 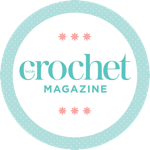 . . – My "Round Tuit"
The top of my crochet wish-list . . . According to the comments on this post – this is a really simple pattern to follow – I’ll have to let you know when I finally get a round tuit!